This week on DCI.org, we've been examining the similarities and differences between drum corps and athletics. The corpsmates of Matt Gibson in the Colts suggested a simple penance for his missing a rehearsal weekend due to collegiate wrestling responsibilities: Direct the corps in his wrestling singlet. Matt Gibson's official Northwestern College headshot (left). At right, he demostrates a Greco-Roman style throw. "I didn't fall for it, though," said Gibson, the corps' 2004 drum major. Gibson, who wrestles at 141 pounds at Northwestern College in Orange City, Iowa, admits that on top of his wrestling conditioning and practices, as well as homework, he doesn't have an enormous amount of time to devote to drum corps. "Wrestling requires a huge time commitment. I get up early almost every day to get an extra workout in and to drill some technique. The actual practice also takes a few hours and leaves me exhausted for the rest of the night. Add homework on top of that and there isn't a whole lot of time to practice for drum corps. I had to find small chunks of time to get in front of a mirror to practice my conducting," Gibson said. The Newton, Iowa, native does say that there are mental similarities between drum corps and wrestling. "It's all about keeping yourself motivated," Gibson said. "There was a poster in our locker room in high school that said "Everything in life is easier once you have wrestled." I think the same applies to drum corps, and it all has to do with the mindset that comes with being in the activities." Both activities are also mentally and physically taxing, Gibson admits. "They both involve a huge time commitment and it can be tough to persevere through both a season. They both involve a year-round commitment," Gibson said. Gibson's fellow matmen don't quite grasp Gibson's drum corps career. "This past summer I e-mailed the wrestler who was supposed to be my roommate on a free day, and I explained to him that I was in drum corps and I was gone all summer. He was afraid that I was going to be a "band nerd" so he switched roommates. Once we got to know each other we became really good friends," Gibson said. On the other hand, his fellow corpsmates are very supportive of his grappling career. "They always ask how my season is going and all. 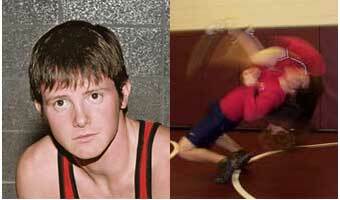 They don't really understand wrestling either, especially cutting weight, but they are very supportive," Gibson said. However, Gibson has had to make difficult decisions when wrestling and drum corps events coincided. When a recent scheduling conflict arose, Gibson had to choose between the two activities. "I had to miss January (Colts) camp due to a wrestling meet. I hated missing it because its the only camp that I had ever missed, but I figured I better go to the wrestling meet since we were in the heat of the season and it was still very early in the drum corps camp season," Gibson said. Looking to the future, Gibson plans on working in emerging technologies. "Once corps and wrestling are over, I want to focus on my career as a computer science major. I am quite a bit behind other majors because they all have internships, and getting that first experience is hard to do, and I haven't had the opportunity to get an internship because of corps. I'd like to get an internship and then go onto graduate school, possibly working with virtual reality," Gibson said.